May B. by Caroline Starr Rose. Review: "Ma and Pa want me to leave and live with strangers. I won't go,'' May said. Mavis Betterly just found out that her parents are sending her away to live with strangers for five months, until Christmas comes around. This is the beginning of May B., an engaging book by Caroline Starr Rose. May B. is getting sent to live with the Oblingers in their new home, where she will help them and earn money for her family. Even though it will help her family, May dreads going away. The reader soon learns that Mrs.Oblinger isn't too thrilled about May coming. Mrs. Oblinger and May hate each other as much as they both hate the sod house. When May thinks things couldn't get any worse, Mrs. Oblinger gets upset and disappears, forcing a lonely Mr. Oblinger to run after her. He leaves May alone in the sod house, which is located in the middle of an empty prairie, miles from the nearest town or single home! Then a blizzard hits, trapping her in snow. Will May be able to hold out by herself until the Oblingers' return? Will anyone come to May's rescue? Caroline Starr Rose's unique writing style keeps you glued to the book. It gets hard to stop turning the pages when you are always left with a cliffhanger! Every page leaves you wondering how the situation will develop. Also, Rose demonstrates incredible character development as she shows how May struggles through the blizzard and the challenges of learning to read. The author created May to be such an inspiring young girl. Through her struggles, May learns to overcome her fear and just think about herself. She finds her courage and shows that it's all up to her to save herself because who knows how long it will take for someone to find her! May finds her own voice, and I think Rose hopes to show readers how to find theirs! 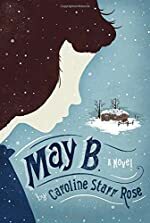 May B. deserves five stars for its excellent story line, development, and for giving readers a new inspiration---a girl named May Betterly! Review written by Gianna (6th grade student). We would like to thank Random House for providing a copy of May B. for this review. Have you read May B.? How would you rate it?